Like it or not, a great website design matters. In the current age, a visually-stunning website is imperative as it affects how your customers value your products and services. If you are on WordPress, then you already know how fast and easy it is to set up and manage a personal blog, portfolio or website. The growing popularity of this undisputedly most popular CMS is inspired by the creations of thousands of well-designed and responsive themes that allow you to showcase your work in a beautiful and organized manner. The wide collection of themes on the market makes it daunting to narrow down your options to the very best. New themes come up every month and finding quality WordPress theme is not easy, but there are some themes that have consistently stood the test of time. While Premium themes offer solid code, additional features and reliable support team not present in most free WordPress themes, there are several free themes that are too sweet to ignore. Some of them provide better functionality than their Premium counterparts. You have probably heard discussions in online forums that WordPress free themes are risky because they are not well supported or that they are designed and developed by amateur developers which isn’t the case. If you are just starting out and your budget is tight, it is advisable to use free WordPress themes rather than go premium. The right theme will help to convert your online visitors into readers and readers into customers. We present to you a new selective list of the best Free WordPress themes of 2019. Each of the listed theme has a powerful feature/s that will make you think twice about paying for a WordPress theme. 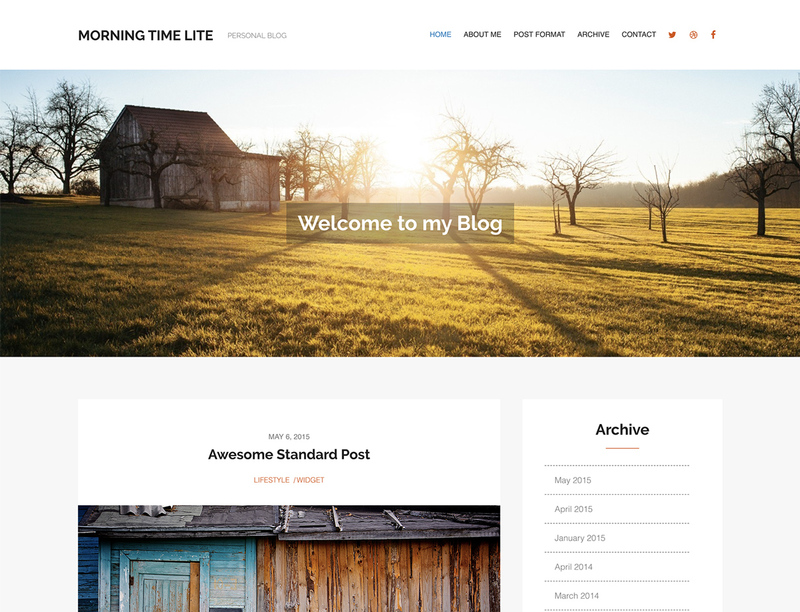 Morning Time Lite is an incredibly dynamic WordPress theme by WPlook Themes that will greatly improve your web development process. This theme manages to balance high functionality with remarkable graphics. 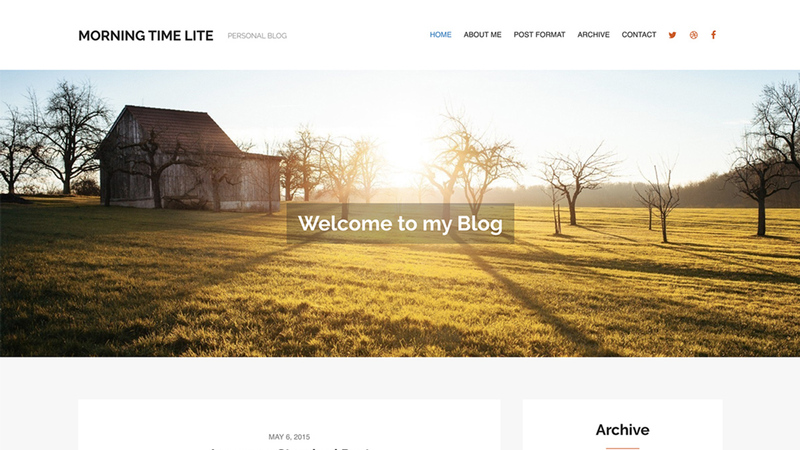 The beautiful design in Morning Time Lite makes it ideal for a wide range of websites including Family Blog, Personal Blog, Journalists and anyone looking to connect with their audience intimately and professionally by sharing their daily thoughts. The multiple post formats in Morning Time Lite theme means that you will be able to grab your visitors’ attention and keep them coming back for more. Archive your posts and let your visitors find your past articles conveniently. With Charitas Lite, you get a lightweight and flexible theme with fine-tuned typography that can be customized to fit your Nonprofit site. 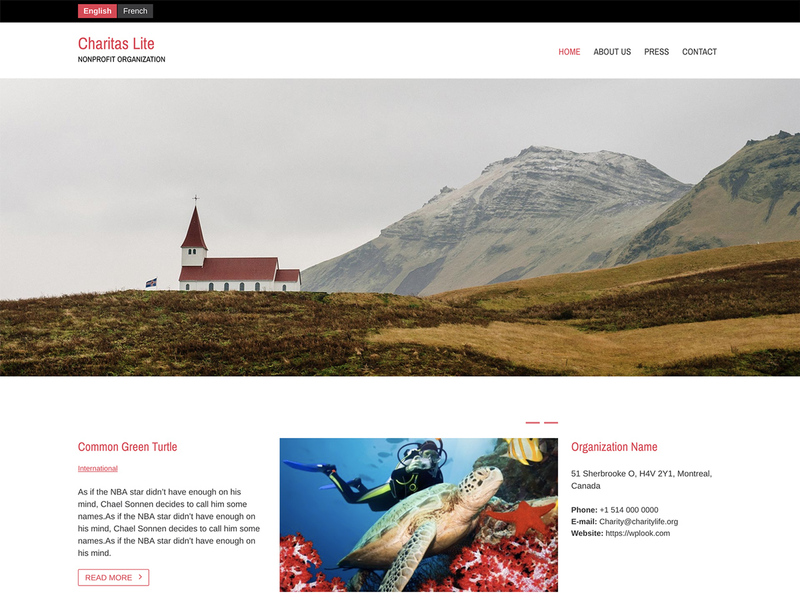 Charitas Lite is free nonprofit WordPress theme minutely crafted and developed for Foundations, NonProfit associations, Churches, Charity Organizations, and Political Organizations. Unlike other free themes for Charity, this theme incorporates a remarkable balance between functionality and aesthetic appeal. It is compatible with iOS, Android, Tablets, Windows Phones and desktop computers. This theme also supports high-resolution Retina Display, meaning your online visitors will enjoy sharp texts and crisp graphics. With 2k+ organizations using this theme for their sites, you will definitely grow your organization and build trust and credibility among your readers or customers. Online merchandising can be a reliable source of income, for those who decide to build a personal store for their sites. 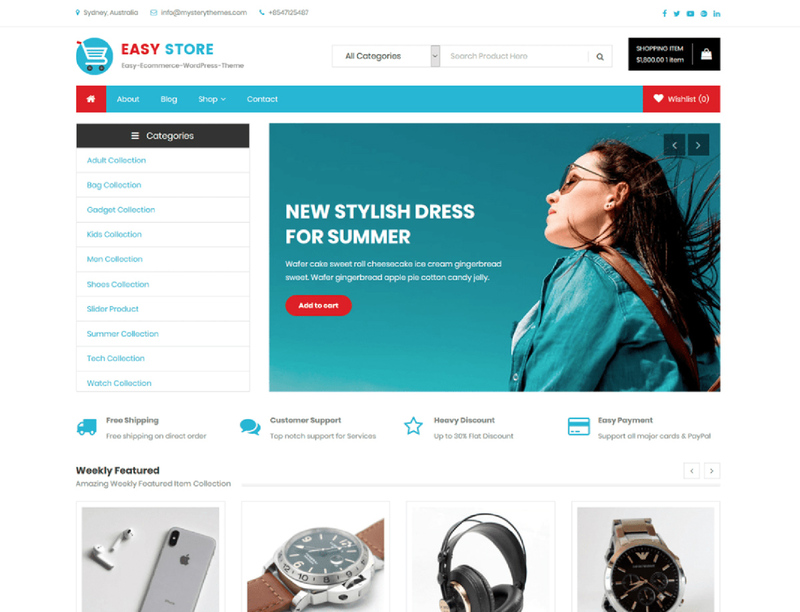 Easy Store by Mystery Themes is an attractive eCommerce theme that is compatible with the world famous WooCommerce plugin. This developer-friendly theme has an elegant design that gives your online visitors the best user experience. It will take care of your website’s look and feel. Easy store is also compatible with YITH WooCommerce Wishlist. Looking to share your views and passion to the world in a magazine-style design? Newsmag breathes a new life to make your website stand out. 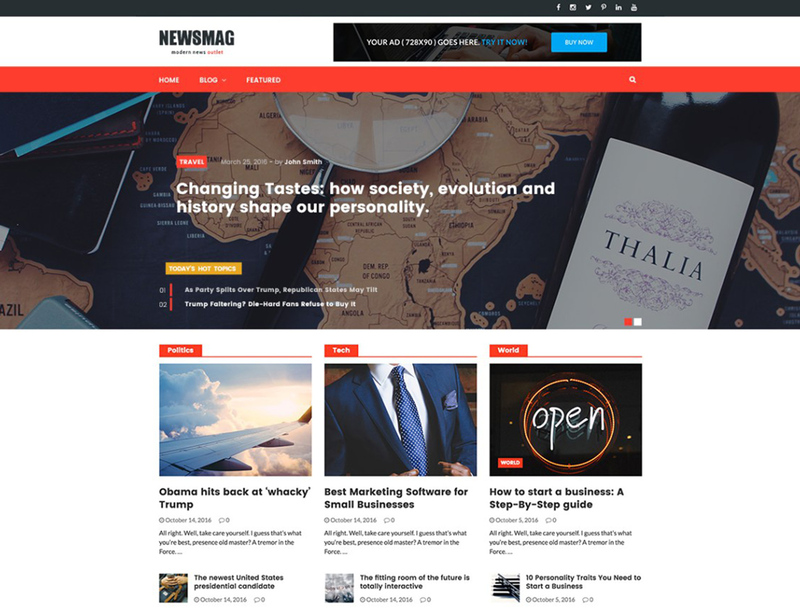 Newsmag is a contemporary and clean free blog, news or magazine WordPress theme by machothemes. This fully responsive and SEO friendly theme is compatible with popular WP plugins. You will never run out of content to post thanks to the 4 different Blog Page Styles, Dynamic Widgets and 3 different block styles in Newsmag. You can easily integrate Google Maps to this theme. Customize your website to your liking using the unlimited Color Schemes and Google Fonts. 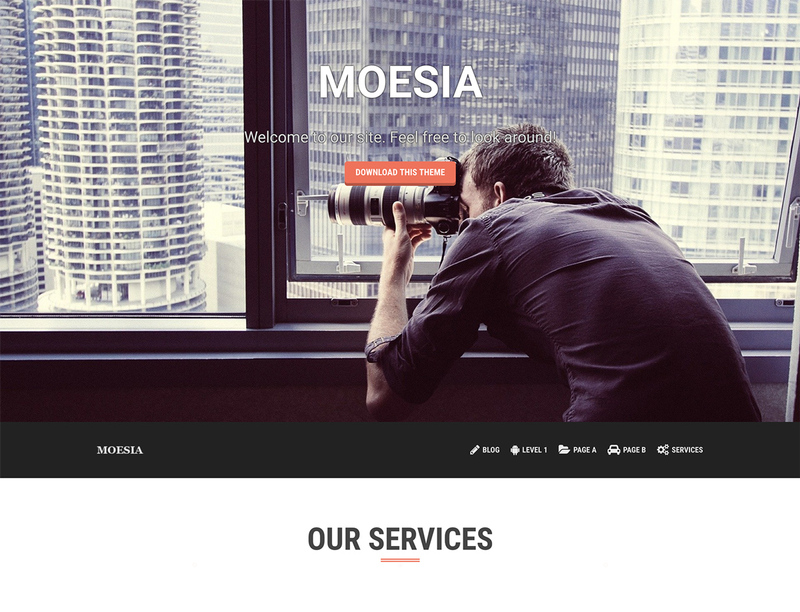 Moesia is another great theme from our collection of best free WordPress themes that will assist you to develop an effective online presence. Designed with best practices in mind, this theme will enable you to customize your website’s layout and front page thanks to the inbuilt powerful Theme Customizer. There is no need for coding knowledge, as the process of building a website using Moesia is pretty intuitive. Pick from 11+ pre-defined blocks to build a homepage that best represents your brand. You can also choose a color combination and font of your choice, all thanks to Moesia’s own set of colors and Google Fonts. Other smart features you will enjoy in Moesia include 2 layouts, Parallax Header and Cool Animations and Effects. Moesia is 100% translation ready to make the translation process a breeze. 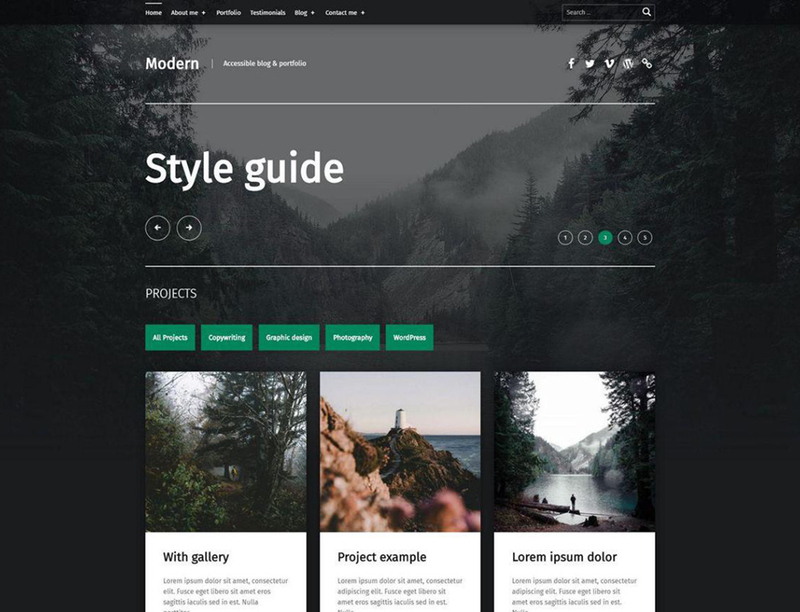 For those looking for a simple, modern and easy to use WordPress theme, Make is the right theme. 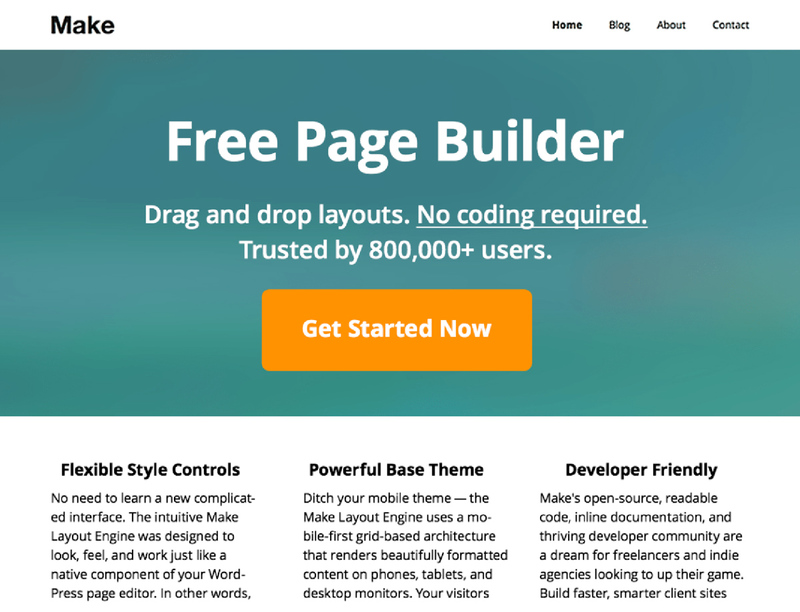 Make is an amazingly flexible and incredibly multipurpose WordPress theme that has been carefully designed and developed to help you build a perfect website. Make’s Powerful Drag and Drop Page Builder is packed with several Customizer Options to allow you to brand your site effortlessly without touching a line of code. The Galleries, Columns, and Banners in this theme will make you showcase your best work efficiently. Your website will look great on mobile devices, the same way it will appear on desktops. Make supports popular WordPress Plugins like Jetpack, and Gravity Forms. 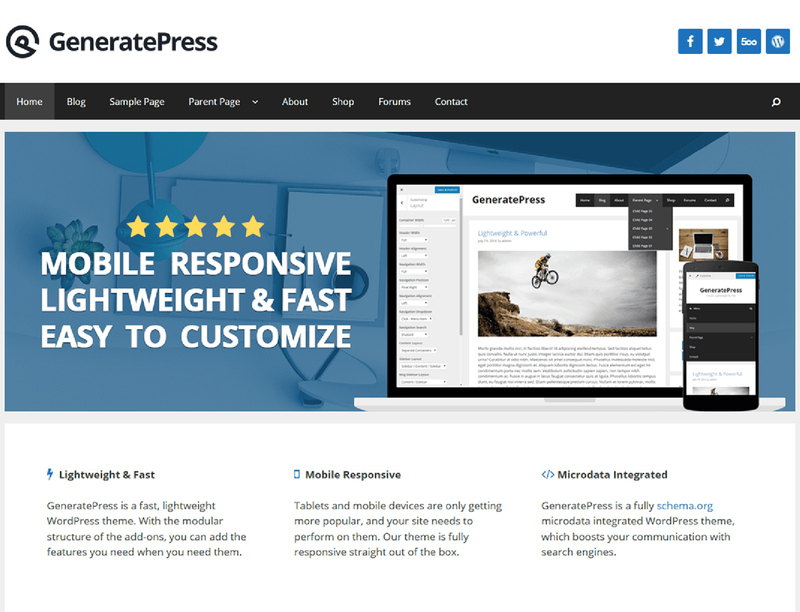 GeneratePress is a lightweight, extensively crafted and lightning fast theme by Tom built for SEO, speed and usability in mind. This adaptive theme will help you create an awe-inspiring theme that works seamlessly with your preferred page builder. Putting emphasis on WordPress high coding standards, this theme supports major WP plugins like BuddyPress, WPML, WooCommerce and bbPress. Smart Features include 5 Navigation Positions, 9 Widget Areas, 5 Sidebar layouts, Dropdown Menus and a Back to top Button. Translated into 20+ Languages, you will enjoy the great community support in GeneratePress. This theme is 100% responsive to provide an impressive reading and browsing experience for your visitors on smartphones, tablets and desktops. Hestia is a responsive, free and minimal theme that adapts the latest technology to give you a one-page design with a modern look and smooth scrolling. This easy-to-install theme is fully compatible with page builders to help you build and fine-tune an awesome-looking content with ease. If you experience any difficulty, the Video Tutorials will guide you through the entire process. Hestia is Translation and RTL Ready in case you want your website translated to any RTL language. The SEO friendly nature of Hestia means that your business will have a commanding online presence. Hestia’s Live Customizer will help you personalize your website and view the changes in real time. 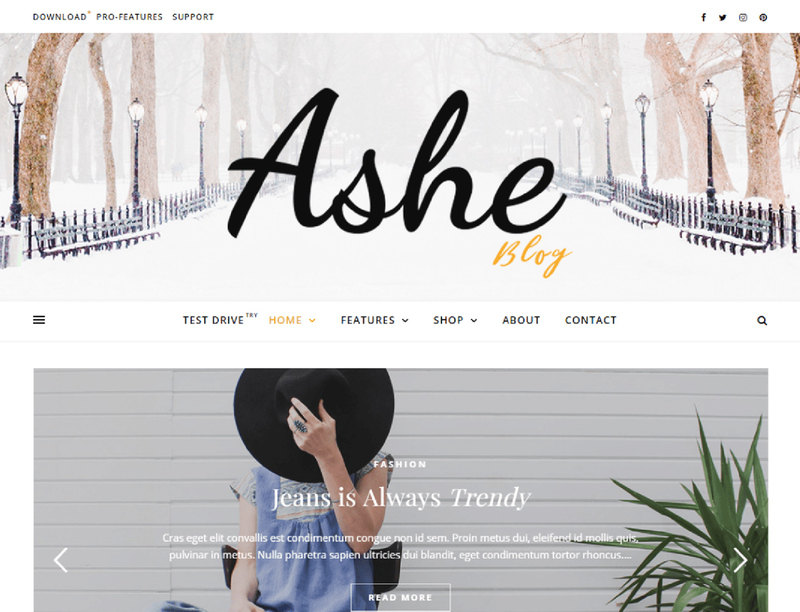 Ashe is a Minimal, Multi-Author and Free Personal WordPress Blog Theme by Royal Flush. Ashe incorporates wide-ranging design and structural solutions for your website’s requirements. This theme is best suited for food, health and fitness, bakery, cooking, personal, fashion, beauty, news, photography, auto blog, travel, startup business and any kind of amazing blog. The WooCommerce integration in Ashe will allow you to turn your website into an online store where you can put up any product for sale. Ashe is well documented and has a friendly UI that is beginner friendly. Thanks to the awesome high-end features in Ashe, your online presence will be a reality. 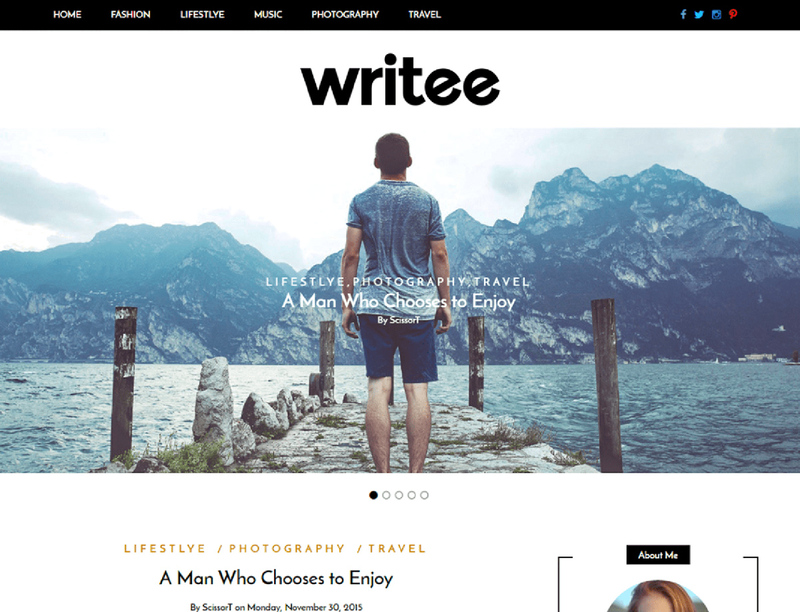 Writee is a Smart, Flexible and Powerful WordPress theme best suited for fashion, travel, food, corporate or any other personal blog. The pixel perfect and responsive design in Writee makes it look incredible in all mobile devices. Smart features include Customizer Options, Custom widgets and full-width slide to display your content in an attractive manner. Writee theme is WooCommerce compatible in case you want to sell some merchandise straight from your website. You can translate your website into many languages including Arabic, German, Spanish, Russian, French and Italian. Just as it names puts it, Modern is a contemporary and accurate-looking accessibility ready blog theme best suited for personal portfolios. This theme is mobile optimized and SEO ready to give your users the best user experience. Designed using translation-ready code with full RTL multilingual support, presenting your content to your international audience will be a breeze. Modern WordPress theme puts emphasis on readability to put your website content ahead. Modern is designed to fulfill many things including allowing you to express yourself by sharing your thoughts or writing about your findings. Want a better blog? Pictorico is a free AA single-column blogging WordPress theme developed by Automattic. 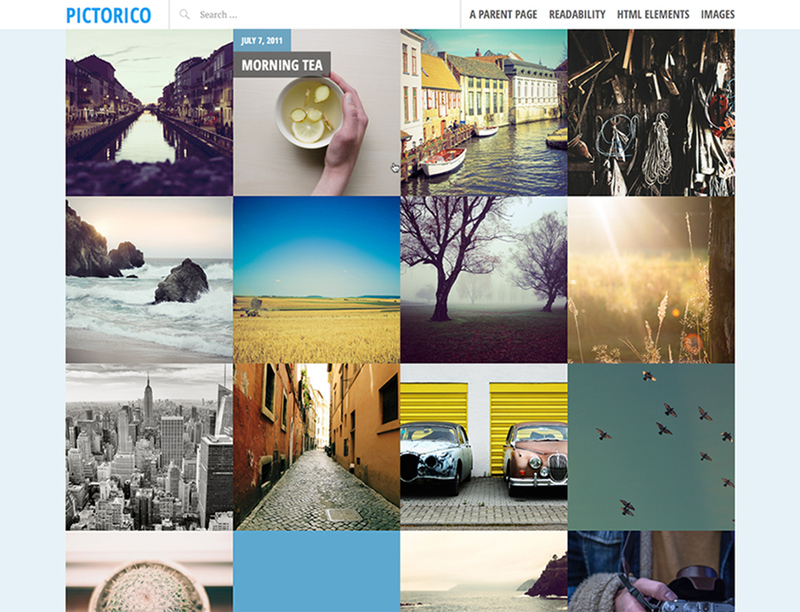 Pictorico features a large-sized image and poster slider tailored to the needs of a travel or photo blogging site. 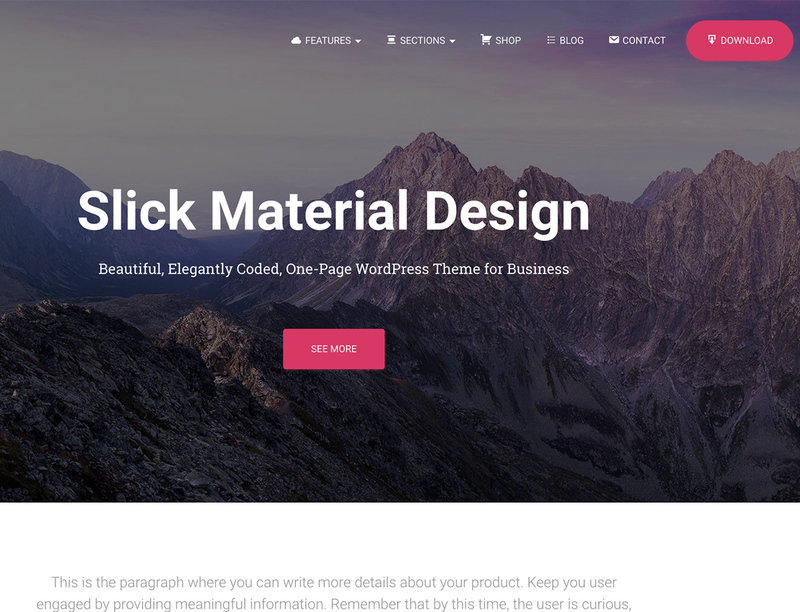 This theme would look great on both personal and corporate websites. Pictorico theme has been coded with the best SEO practices in mind and optimized for speed so your visitors don’t have to spend ages going through your site. Pictorico allows a smooth responsive layout that is sure to keep your online visitors glued to your site. 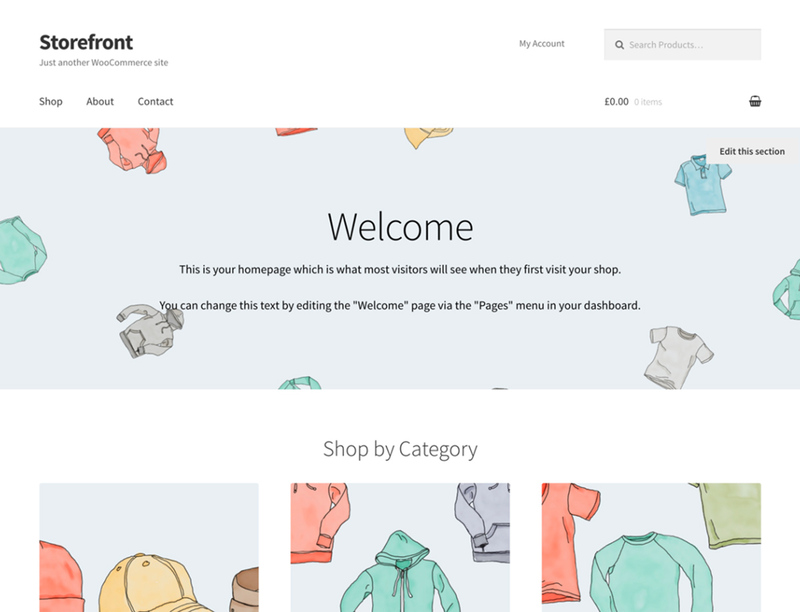 Storefront is the ideal theme for an eCommerce website. This theme is specifically designed and developed for WooCommerce core developers. You will enjoy the multiple layouts, color options, and popular WooCommerce extensions to customize your online store to your liking. The responsive design in Storefront will make it a joy to crawl. This theme is meant for small business owners looking for a responsive and SEO friendly theme without breaking their banks. Business Elite is a clean and professional free WordPress theme perfect for promoting your corporate identity and reach more clients. Business Elite might look plain at the first glance but it has many nifty features to spice up your site. This 1-page theme embraces the parallax technology to make your site appear more appealing. This Business WordPress theme is compatible with most of the popular WordPress plugins like Contact Form 7, Jetpack, BuddyPress, Photo Gallery and bbPress. 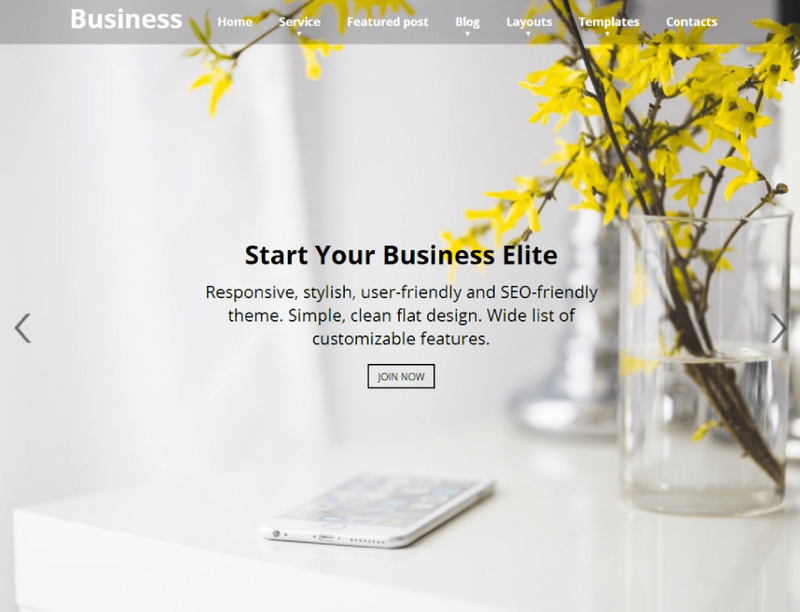 Business Elite is child theme and WPML ready. Business Elite’s is cross-browser compatible, mobile friendly and retina ready to improve your website’s overall responsive appearance. 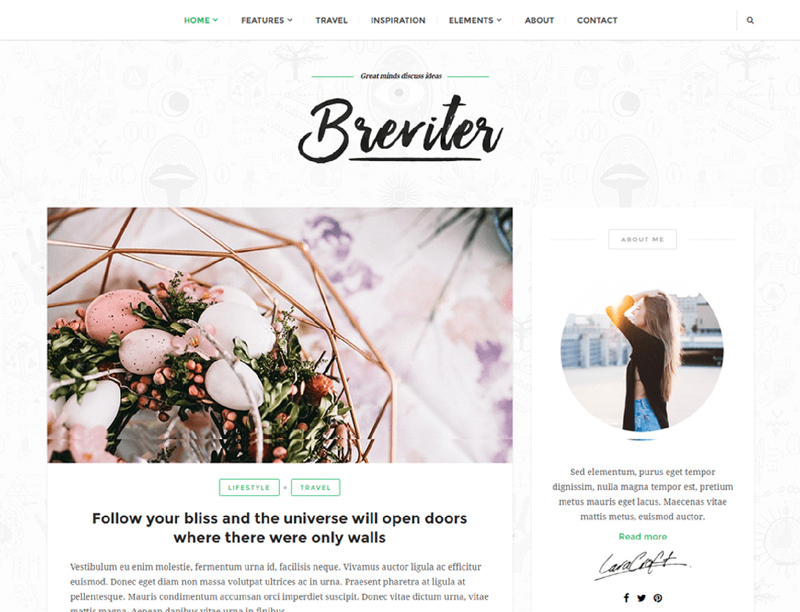 Breviter is an elegant and user-friendly multipurpose theme best suited for creative bloggers and professionals. Created on a clean, robust and beautiful code, you can customize it for your website just the way you want it to look. Breviter WordPress theme has a responsive design to ensure each of your visitor’s browsing experience is pleasant, regardless of the gadget they are using. Breviter’s design is toned down to put special attention to your loading speed and content. 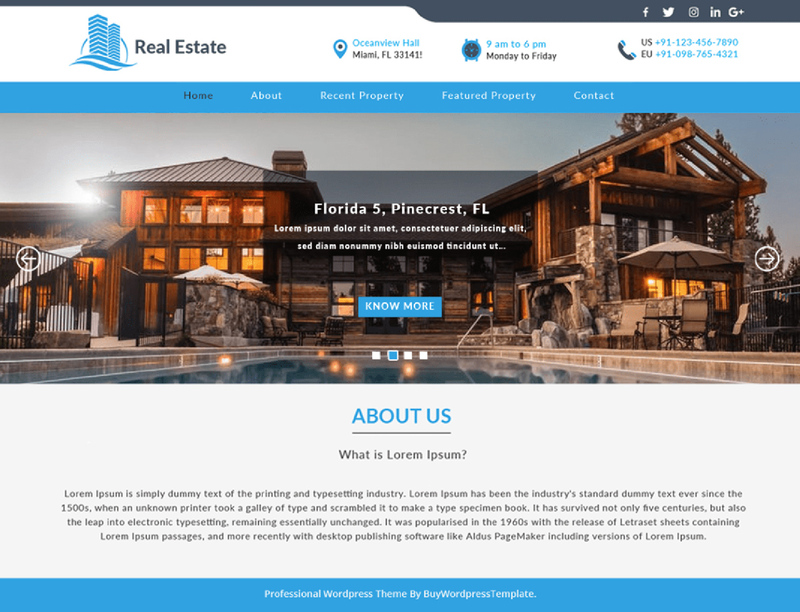 Construction Realestate WordPress theme is a perfect choice solution for builders, woodworkers, interior designers, architects, plumbers, painters, or anybody who is interested in building construction business websites. The theme offers a dynamic customizer with multiple theme options, to bring out the design of your website as per your wants. Construction Realestate theme is built on Bootstrap that makes it highly responsive and cross-browser compatible. Being a mobile-friendly theme, it gives a cutting-edge performance on every screen size. 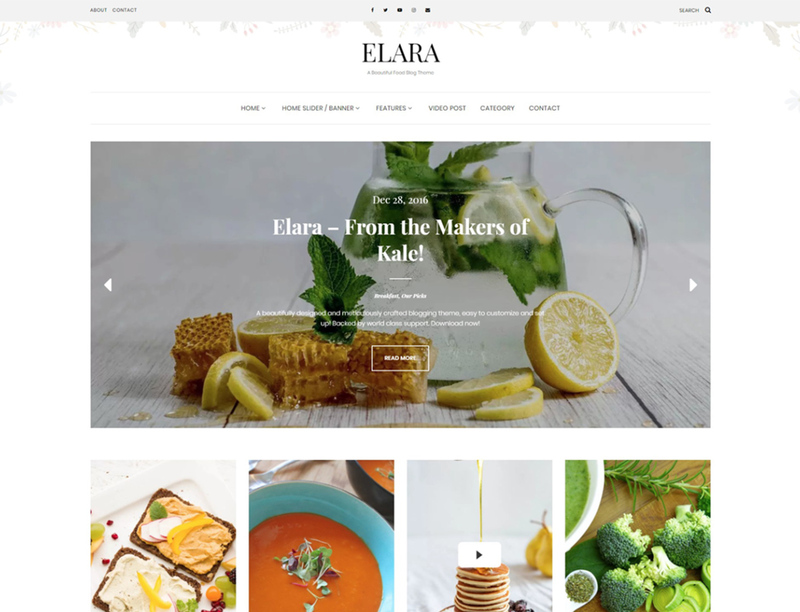 Elara is an elegant and simple free WordPress theme best suited for fashion or food blogs. The theme has a special front page that features multiple sidebar positions, a banner or a posts slider, featured categories, and a highlight post. You can also optionally hide the banner/slider completely. Elara comes built-in with social media icons / menus, as well as Instagram feed integration. You also get several widget locations, such as two special full-width widgets on the front page, sidebar widgets, header and footer widgets. Argent WordPress theme is a modern and eye-catching portfolio theme perfect for creative professionals like photographers, designers, artists, and more. The theme has a simple and elegant homepage template featuring portfolio projects. 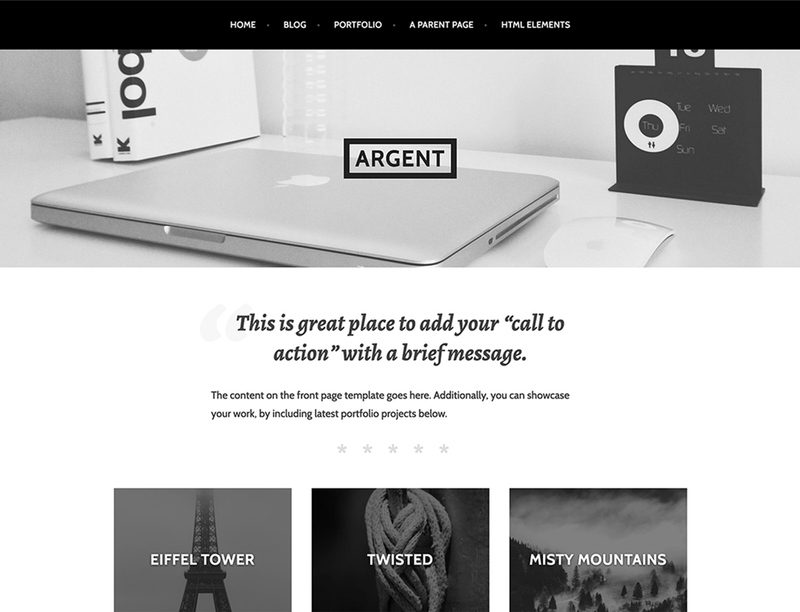 With over 10,000+﻿ active installs Argent WordPress theme could be the next theme for your website to showcase your projects. 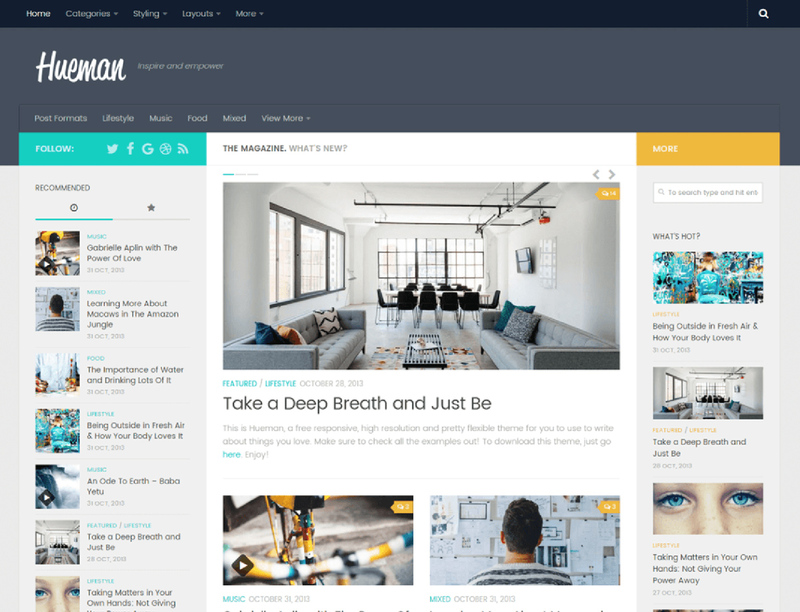 Trusted by more than 3,000 users Mallow WordPress theme is great magazine well-balanced theme for writers of all kinds. It has a lot of great features that will help you to build the website you dream about. 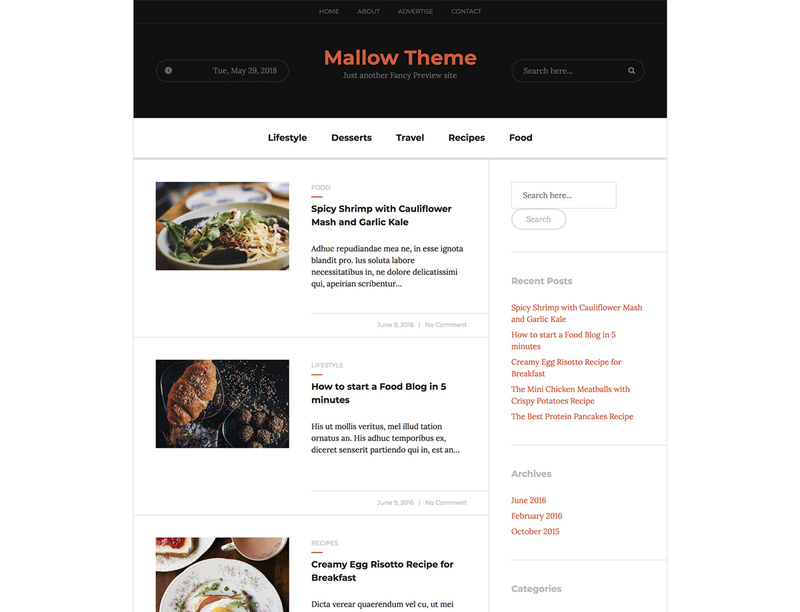 Mallow theme is fully responsive, SEO optimized and has theme customizer that you can use to match your brand. Also with this theme, you can create stunning sliders to showcase your latest content. Moreover, to have additional features and more customization options you can switch to Pro Version ($49). Another free WordPress theme from our collection is The Hueman theme. This elegant and simple theme has 70,000+ active installs and will definitely help you increase your traffic and engage your visitors. The Hueman theme is fast, reliable and well-documented. It has a clean code and lots of potentials to customize. With its attractive design will surely attract your visitors. 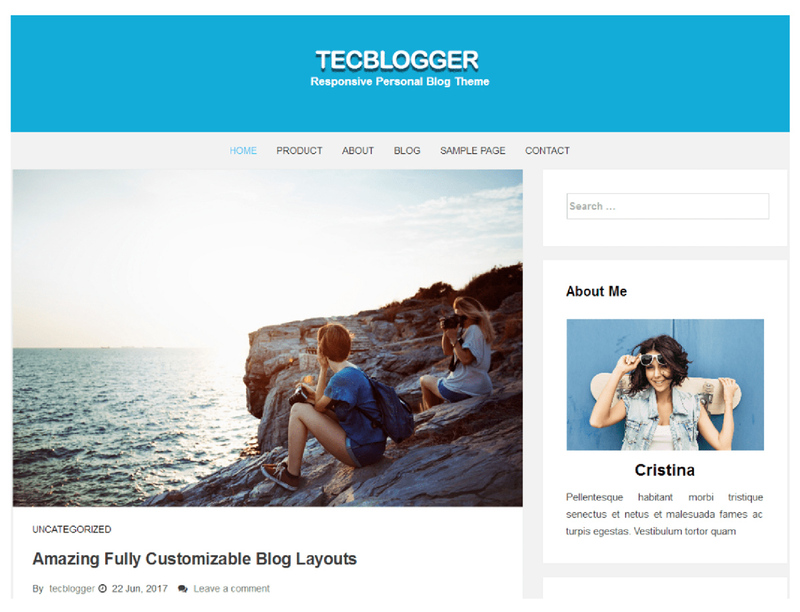 Tec-Blogger is great, dynamic and fast responsive Blog theme for WordPress. It is suitable for travel, personal blog, fashion, photography, sports, etc. It has a colorful look and it is built with latest design trends. This free theme has great features and custom widgets. Finding a theme does not mean you have to spend hours browsing the web for Premium themes. There are plenty of free WordPress themes that will work just fine. All the themes we have discussed feature a responsive and visually attractive design. Find one that best works for you to achieve your online goals.